The Throat of the Devil. At first thought, it may not sound like any sort of dream destination. Sounds a little dangerous, and probably very hot…Well I can’t argue with that, but if I went on to tell you that it was the name of one of the world’s largest waterfalls, would that change your perspective? La Garganta del Diablo is the biggest single falls within the biggest waterfalls reserve in the world Iguazu Falls – and it’s absolutely worth the risk. The heat of Puerto Iguazu is inevitable. This immaculate world wonder is located on the border of northern Argentina and southern Brazil. A tropical forest this beautiful could not be maintained without a hot and humid climate, so prepare yourself before hand. Bottles of water go like gold in the various stops within the park and are anything but cheap. Bring your own, maybe some food as well, and you’ll save some big bucks. 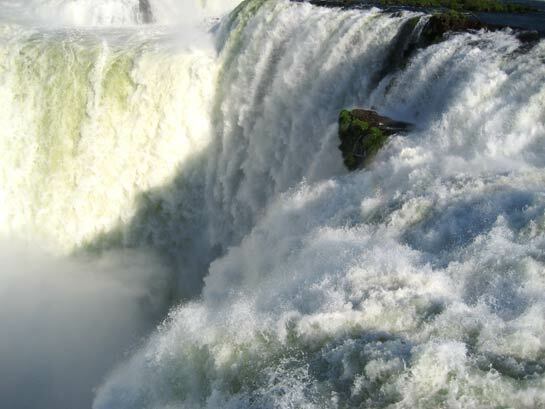 The park is huge and consists of 275 – 350 separate falls depending on the season you arrive. Usually it requires a couple of days to see it all and more than likely, by the end of this time, you will have lost any previous inhibitions or shyness, and will be walking around the park in nothing but a bathing suit along with everyone else. Luckily, the park is surrounded in water and provides plenty of opportunities for a good dunking. Get an early start to avoid some of the crowds. People flock to Iguazu from all ends of the world and elbow room is always a little sparse when trying to snap that perfect photo. But when you finally come into view of a huge fall cascading down into an unknown depth lost in the mist you will forget about the others surrounding you. Your park map and your own two feet will lead you to every falls in Iguazu, but the best and biggest should be saved for last. From the Argentine side, the paths to La Garganta del Diablo will take you through a long stretch of calm waters. As you get closer, you begin to hear the rush of the water. At first sight its presence is deceiving and it appears somewhat small. Then as you get closer, the excitement rises and the conversations dissipate while everyone awaits the giant that lies ahead. The roar of the water gets louder and the cloud of mist gets larger with each step. What seemed small a few yards back is now right before you and indescribable in words. The massive size, dynamic waters, and incredible views can only be understood through experience. Hundreds of birds add to the spectacle as they dive into the waters below and are engulfed in the huge falls. 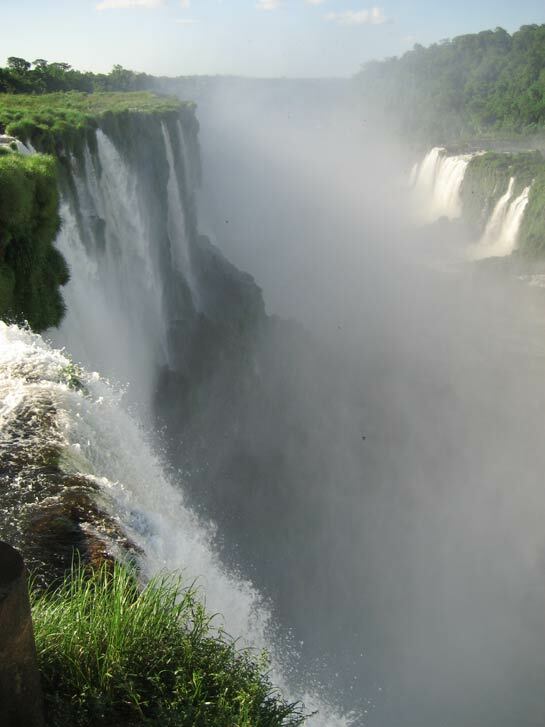 La Garganta del Diablo can also be viewed from the Brazilian side and gives you a more frontal perspective. But regardless of which side you see it from, you will leave with a redefined impression of the awesome power of nature. 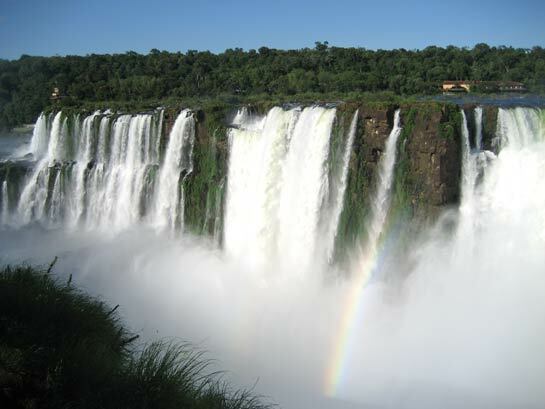 Here’s a tip: Go to Iguazu in early September. The place was not crowded at all! I expect that would be true for most of the summer and early fall months in the northern hemisphere (winter – early spring in South America). Not only was Iguazu not crowded, but the weather was perfect: warm, not hot, and humid only because of the spray from the falls! If you can afford it, stay at the Sheraton in Iguazu National Park. It’s a gorgeous hotel with views of the falls from many of the rooms. 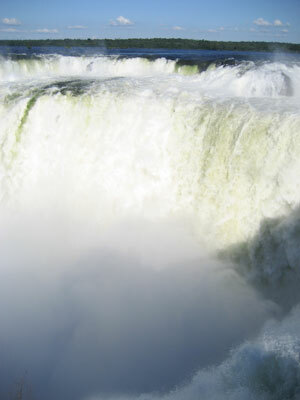 Iguazu Falls was an amazing vacation for us – we went last year for a few nights. My travel tips would be to visit the nearby Bird Park, and trying to book a hotel right next to the falls themselves – that’s the best way to avoid all the crowds. a place i fell in love with! It was something that you had to had to see for yourself. I will never forget it.. This page rendered in 0.221 seconds.